It's been a while since my last confession so hope everyone is doing well. 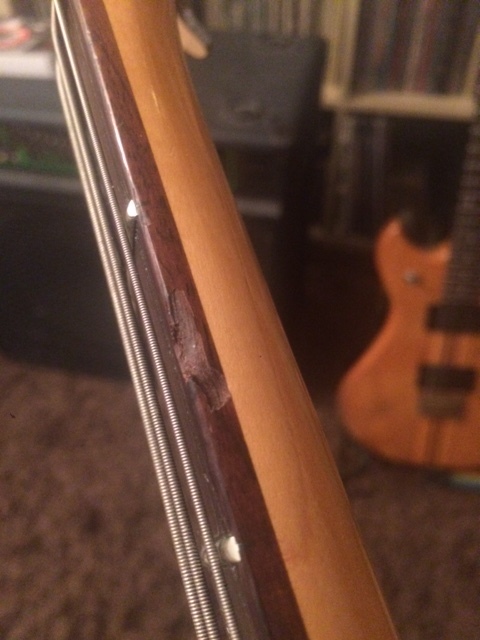 I have a Thunder I bass that one of my darling offspring has knocked over and taken about a half centimeter long chunk out of the fretboard. 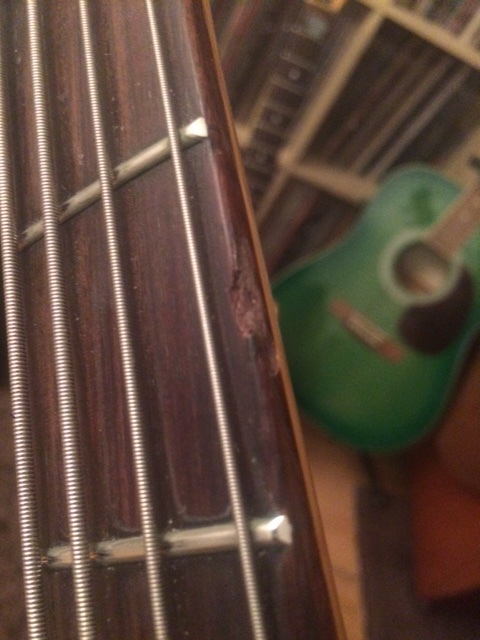 This has left a really sharp edge so it's currently unplayable for fear of laceration. No doubt sanding it down will make it playable again but what would you use to fill the chip? Would just coloured filler suffice? It's about half a centimeter long on the underside and about 2-3 millimeters wide (on the face of the fret), so not that big but it will potentially affect playing if you hit close to the bottom of the fret. Should think a mixture of wood glue and some rosewood sanding dust will fill that. Mix plenty of dust in there, more dust the darker it will be. That should do it, but it would still be helpful to see some pix. Yep glue n' dust will do that nicely, only a wee nick. Thanks for the replies. Makes sense and I'm keen to have a go at fixing something myself for once! The only problem I foresee is that I don't have any rosewood or know where to get any to make the dust. I think I'll see if the guitar workshop at PMT (Professional Music Technology) have any off cuts they'll let me have. They can only say no! do you have the chunk(s) that broke off? I don't have the bits that broke off unfortunately. Sneaky kids must have binned them hoping I wouldn't notice! Thanks for the tip on the turning blank, I wouldn't even know what to look for!